Anyone fortunate enough to have a wool blanket already knows how they are beneficial during times when the weather turns cold. However, there are many other uses for wool blankets that many people might not know is possible, yet can be quite helpful and a great way to repurose vintage wool blankets. There are many places where you can purchase vintage wool blankets. One of the best places is a local thrift shop in your area. You also may be surprised to learn you can look at army surplus stores for vintage wool blankets. Another option is to see what is available online. Vintage wool blankets have many advantages over the use of synthetic products. Wool is a product that is naturally fire resistant and can even keep people warm when it is wet. Another detail about wool that many people may not know is the material contains no toxic materials. There are many things to consider when looking to purchase vintage wool blankets. A common issue is blankets that have moth holes. This means you need to examine the blanket fully to see if there are any obvious problems. A wool blanket can do much more than provide warm during cold weather. You can use a wool blanket as insulation for a bed or even a cot. 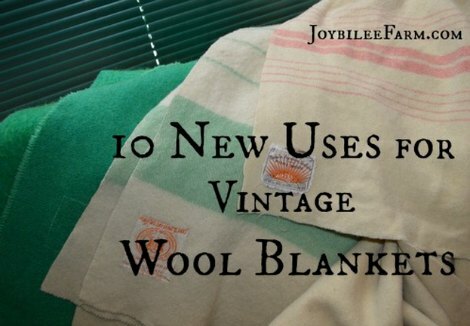 Vintage wool blankets can be used to cover areas to easily prevent drafts of cold air. This is also a great option for pets that are in a pet carrier.